Voodoo Lounge may be the best album that The Rolling Stones has issued in quite some time, but it still pales in comparison with the band's work during the late '60s and early '70s. For the most part, the set seems designed to feed the hype surrounding The Rolling Stones' latest concert tour. 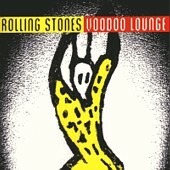 While the songs on Voodoo Lounge are very enjoyable, they certainly don't cover any new ground. Instead, they wander the same dark and lonely pathways the band has visited time and time again over the years. Love Is Strong, You Got Me Rocking, Sparks Will Fly, and I Go Wild are all cut from the same mold of bombastic arena-ready rock, and many of the album's tracks are too similar for their own good. Even the best songs on Voodoo Lounge (Blinded By Rainbows and Out Of Tears) borrow heavily from the group's exquisite early ‘70s ballads. Still it is nice to see The Rolling Stones returning to the sounds of its most creative era, though it would be nice if its attempts at a resurgence either were more convincing or ventured somewhere new. Voodoo Lounge is available from Barnes & Noble.